Shakhtar and Zorya will finish the 2015/16 season by playing this game. That’s a major encounter for both sides. The Pitmen’s major goal is winning the trophy this anniversary year. Notably, Shakhtar won the domestic cup last time back in 2013. Yesterday, Donetsk team held an open training session, with Taison and Darijo Srna communicating with reporters before the session. Shakhtar captain gave Zorya and the coach their due, noting that the Orange-Blacks are fully focused on the cup final decider. 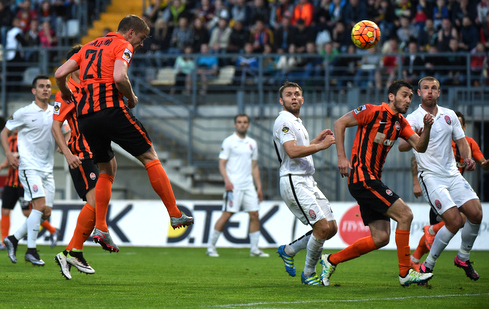 Luhansk are motivated no less than Shakhtar – a possible victory could be the first achievement of Zorya in the Ukrainian period. The team appear in the Cup final for the first time. On the way to this match, the charges of Yuriy Vernydub knocked Kherson-based Kristal, Kharkiv-based Helios, Lutsk-based Volyn and Dnipropetrovsk-based Dnipro out of the competition. The teams are meeting in the Ukrainian Cup for the first time. On May 15, the teams played in the domestic league closing round. During the opening thirty minutes, Mircea Lucescu made two forced substitutions, fielding Matviienko and Zubkov instead of Kobin and Shevchuk. Shakhtar took the lead on 32 minutes after the goal by Ferreyra, with Zorya responding with a brace by Andriy Totovytskyi. On 74 minutes, Gladkyy equalized. However, the same Andriy Totovytskyi was the last one to put his name on the scoresheet after netting a hat-trick. The result is 3-2 in favour of Zorya. Shakhtar are playing in the Ukrainian Cup final for the 16th time. Shakhtar boast 127 goals this season (the record which can still be updated).